"Raúl González" redirects here. For other uses, see Raúl González (disambiguation). This name uses Spanish naming customs: the first or paternal family name is González and the second or maternal family name is Blanco. Raúl González Blanco (Spanish pronunciation: [raˈul ɣonˈθaleθ ˈβlaŋko]; born 27 June 1977), known as Raúl, is a Spanish former professional footballer who played as a striker. Raúl is considered one of the most important players in the history of Real Madrid and regarded as one of the greatest Spanish players of all-time. Raúl was born in the San Cristóbal de los Ángeles neighborhood of Madrid where he played for the local youth team before moving to the Atlético Madrid youth team. He later moved to Real Madrid's youth academy and played at its various levels. In 1994, he signed his first professional contract with the fourth division team Real Madrid C, and then was swiftly promoted to the first team. He spent 16 years of his career playing for Real Madrid and is the club's second all-time top goalscorer with 323 goals, and he is the most capped player in the history of the club, with 741 appearances. With Los Blancos, Raúl won six La Liga titles, three UEFA Champions League titles, scoring in two finals, four Supercopa de España titles, one UEFA Super Cup and two Intercontinental Cups. In 2003, he was appointed captain of the team and retained that position until his departure from the club in 2010. He then signed for Schalke 04, where he won a DFB-Pokal and DFL-Supercup, before signing for Qatari club Al Sadd in 2012, where he won the league and the Emir of Qatar Cup. He ended his career with New York Cosmos in 2015, after winning a domestic treble. In La Liga competitions, Raúl is the fifth-highest goalscorer in the history of the competition with 228 goals. He is also the highest Spanish scorer in European leagues, with 256 goals, scoring 228 goals in La Liga and 28 goals in the Bundesliga. He is also the second-most capped player in the history of the Spanish competition, with 550 matches played, is the third highest goalscorer in Champions League history with 71 goals, and the fifth most capped player. He has also played 1,000 matches played in his career, making him one of only 18 players to have achieved this landmark. Although he did not win any major competitions while playing for the Spain national team, he scored a then-record 44 goals in 102 appearances for la Roja, appearing in three FIFA World Cups and two European championships. Raúl took over the captaincy of the side in 2002 and held it until 2006, the year in which he played his last international match for Spain. Raúl was named the best striker in the world by International Federation of Football History & Statistics in 1999, and is the only player to be named UEFA Club Forward of the Year three times, in 2000, 2001 and 2002. He ranked second in the 2001 Ballon d'Or and third in the 2001 FIFA World Player of the Year. In 2004, he was named in the FIFA 100 list of the world's greatest living players, and was included in the UEFA list of the 50-best European players of the 1954–2004 period. He was part of the European Team of the Year of European Sports Media in 1997, 1999 and 2000. Raúl won two Pichichi trophies (1999 and 2001), the top goalscorer award of the UEFA Champions League (2000 and 2001), five Don Balón Awards (1997, 1999, 2000, 2001 and 2002) and one Best Player Award at the Intercontinental Cup in 1998. Raúl's career began at his local team CD San Cristóbal de los Ángeles playing for their Alevín team and the Infantil the next season. He signed with Atlético Madrid's Infantil team and won a national title with the Cadete team the following season. Following Atlético's then-president Jesús Gil decision to close their youth academy as a cost-saving measure, Raúl moved on to Real Madrid's Cadete team in La Fabrica. The following season, he was promoted to the Juvenil C team and subsequently went on to play for their Juvenil B and Juvenil A team. While with the Real youth set-up, Raúl won the Dallas Cup in 1993 and 1994. Raúl wore the #7 shirt for Real Madrid between 1996 and 2010. He started his professional career in the 1994–95 season with Real Madrid C; he scored 16 goals in just seven games and was swiftly promoted to the first team by coach Jorge Valdano, replacing Emilio Butragueño in a symbolic "passing of the crown." He became the youngest player – 17 years and 124 days – ever to play for the senior side, though the record was broken by Alberto Rivera later that same season. On 29 October 1994, in an away game against Real Zaragoza at La Romareda, he created a goal for strike partner Iván Zamorano, heralding the demise of Butragueño in the process. The very next week, Raúl scored his first goal in his second senior game on a home debut against Madrid rivals and former youth club Atlético Madrid in a bitter derby match. Duly establishing himself as a fixture in the first team, Raúl registered a total of nine goals in 28 appearances to help Real Madrid win the 1994–95 league championship in his first season. With Real Madrid, he won several honours, including further La Liga titles in 1996–97 (scoring 21 La Liga goals), 2000–01 (scoring 24 La Liga goals), and 2002–03 (scoring 16 La Liga goals in a campaign truncated by a bout of appendicitis for which Raúl was hospitalised). During the period from 1998 to 2002, Raúl and Real Madrid also won three UEFA Champions League trophies in 1998, 2000, and 2002. For most of this time, Raúl struck up a prolific scoring partnership with Fernando Morientes and later Ronaldo. During a La Liga game against fierce rivals Barcelona at the Nou Camp in October 1999, Raúl silenced the hostile home crowd of 100,000 fans when he scored and then memorably celebrated his goal by putting a finger to his lips as though to tell them to be quiet. Raúl took over the captaincy of Real Madrid when Fernando Hierro was transferred in 2003, a responsibility he held until leaving the club in 2010. Despite appearing in two finals, in 2002 (in which he scored) and 2004, Raúl never lifted the Copa del Rey. Raúl being substituted by Cristiano Ronaldo during a match in November 2009. Ronaldo would wear the #7 jersey at Real Madrid after Raúl's departure in 2010. He became the first player to score 50 Champions League goals when he converted in a 2–1 group stage win over Olympiacos on 28 September 2005, and was also the first to make 100 appearances in the tournament. He was also the first player to score in two Champions League finals, netting in the finals of both 2000 against Valencia in the Stade de France, Saint-Denis, and 2002 against Bayer Leverkusen in Hampden Park, Glasgow. Samuel Eto'o later equaled this feat, scoring in the 2006 against Arsenal and in 2009 against Manchester United, with Lionel Messi also scoring in the same match and later in 2011 against the same team. Raúl holds the distinction of having never received a red card throughout his 17 years at the professional level. On 11 November 2008, Raúl scored his 300th goal for Real Madrid with a hat-trick against Real Unión, with Real winning the match 4–3 but being eliminated on away goals after draw 6–6 on aggregate. In total, Raúl scored 323 goals for Real Madrid, breaking the long-standing club record of Alfredo Di Stéfano (307) with a volleyed goal against Sporting de Gijón on 15 February 2009. He is presently fifth on the all-time list of La Liga goalscorers, behind Argentine Lionel Messi, Portuguese Cristiano Ronaldo, Spaniard Telmo Zarra and Mexican Hugo Sánchez. Raúl and fellow long-serving teammate Iker Casillas were both awarded "contracts for life" in 2008, the terms of which stipulate the contract will be renewed annually for as long as they play 30 matches each season. On 23 September 2009, Raúl equalled former veteran and legend Manolo Sanchís' league appearance record for Real Madrid, and is second in La Liga behind Andoni Zubizarreta, who played in 622 matches. Along with years of captaincy for both Real Madrid and Spain, Raúl was known as "El Capitan" ("The Captain"). Raúl's last touch with the ball as Real Madrid player before an injury ruled him out of action for the rest of that season was to score his last goal, an opening goal scored on 24 April 2010 in a 2–1 away victory against Real Zaragoza in La Romareda, coincidentally the stadium where he made his debut in 1994. It was scored in the 50th minute after Raúl (himself only on the pitch as a substitute for Rafael van der Vaart after 15 minutes) had signalled he could not physically continue and was prepared to be substituted off for Karim Benzema one minute after the goal. Before the substitution could be made, Real Madrid launched a counter-attack to create a goal. Though Raúl ran to a slow hobble, he shuffled into the box and was able to poke the ball from Cristiano Ronaldo's pass. Having spent the rest of the season recovering from that injury, the club confirmed on 25 July 2010 that Raúl would be leaving the club, a day after his teammate Guti confirmed he was also leaving after a 15-year spell. Raúl signed a two-year contract with Schalke 04 on 28 July 2010. Schalke head coach Felix Magath hailed the signing and told the club website, "It's great news for FC Schalke 04, I am pleased that we have succeeded in signing such an exceptional footballer and world-class striker switching to the Bundesliga for Schalke 04." Previously, it was expected Raúl would have finished his career in the United States or Qatar, and that he also received a lucrative offer from an unnamed Russian club. Raúl chose Schalke because they qualified for the 2010–11 UEFA Champions League. Raúl scored his first goal for the club during his first match on 1 August 2010 with a brace in a 3–1 victory over Bayern Munich in the final match pre-season competition LIGA total! Cup 2010. One week later, he made his competitive debut in the 2010 DFL-Supercup on 7 August 2010 again against Bayern, but this time he failed to score in the 2–0 defeat. Raúl made his Bundesliga debut on 21 August 2010 in a 2–1 defeat against Hamburger SV. and scored his first goal for Schalke in the Bundesliga against Borussia Mönchengladbach on 25 September 2010 in a 2–2 draw. After a quiet start, he rediscovered his goalscoring form in the Bundesliga with a brace against FC St. Pauli on 5 November in a 3–0 win, and on 20 November, he scored his first hat-trick for the club in a 4–0 win over Werder Bremen. On 18 December, he scored his second hat-trick for Schalke in a 3–0 win against 1. FC Köln. Raúl scored another crucial goal on 2 March 2011 in a 1–0 victory over Bayern Munich in the semi-final of 2010–11 DFB-Pokal. After being absent for six years, Schalke ultimately reached the finals since 2005. In the final match, they played against MSV Duisburg, the first 2. Bundesliga team which reached the final since 2004. Raúl never won a domestic cup with Real Madrid (the Copa del Rey), but on 21 May 2011, in his first season, he finally won a domestic cup and got his maiden trophy with his new club. They won the tournament with a 5–0 win at the Olympiastadion, Berlin. This success was followed with victory two months later on 23 July 2011 in the 2011 DFL-Supercup against the league champions and rivals Borussia Dortmund. In European play, Raúl has since become the highest goal scorer in all UEFA competitions with 73 goals, ahead of Milan veteran Filippo Inzaghi with 70 goals. He scored 71 goals in Champions League (66 goals with Real Madrid and five with Schalke 04) and addition his two goals with Los Blancos, one goal in 2000 UEFA Super Cup and the other one in 1998 Intercontinental Cup. On 22 October 2010, Raúl scored twice against Hapoel Tel Aviv in a 3–1 win, which tied him with German legend Gerd Müller for the most number of European goals. Raúl duly broke this record on 15 February 2011 on his return to Spain with a crucial away goal in the round of 16 tie against Valencia at the Mestalla Stadium in a 1–1 draw. In the quarter-finals, Raúl scored two goals against Internazionale: one goal in the first leg, a 5–2 away win at the San Siro, and one in the second leg, a 2–1 home win at the Veltins-Arena. Schalke progressed to the semi-finals of the UEFA Champions League for the first time in their history, where they played against Manchester United. Schalke lost the first match 2–0, which was their first home defeat this season in the tournament, and lost again 4–1 in Old Trafford. Despite the defeat, Raúl considered it an honour he had swapped shirts with Ryan Giggs. On 19 November 2011, he captained Schalke for the first time due to an injury to Benedikt Höwedes in a 4–0 home win against 1. FC Nürnberg. He also scored the second goal and assisted the fourth in that match. Raúl scored another hat-trick against Werder Bremen on 17 December 2011. The goals came in a 5–0 win that cemented Schalke's position in third place going into the winter break. On 19 February 2012, he scored the 400th goal of his career, at that time, 323 with Real Madrid, 44 with Spain and 33 with Schalke. On 5 April 2012, in the second leg UEFA Europa League match against Athletic Bilbao, he scored his 77th goal in a European competition. At a press conference on 19 April 2012, Raúl announced he would leave Schalke after his contract expired in June, and that "[his] future is not in Europe". Raúl had such an impact at Schalke that, on his departure, the club opted to retire the number 7 shirt for an indefinite period. However, in 2013, the number 7 shirt was eventually reinstated and given to Max Meyer, Schalke's new prodigy. On 12 May 2012, it was announced Raúl had signed a deal with Qatari side Al Sadd for the 2012–13 Qatar Stars League season. He played his first competitive match for the club on 5 August in the 2012 Sheikh Jassem Cup, scoring a penalty in extra time in order to secure a 2–0 win against Mesaimeer. The veteran also took on the role of captain after Abdulla Koni was substituted. On 13 April 2013, Raúl captained Al Sadd to the 2012–13 Qatar Stars League title. Raúl scored 9 goals in 22 appearances to help Al Sadd win their first title in five years. He was also presented with the post-season QFA-sanctioned Fair Play Award in May 2013. On 22 August 2013, Raúl played for Real Madrid in the first half of the Trofeo Santiago Bernabéu and scored in the 23rd minute. He then played the second half for Al Sadd as Real Madrid won 5–0. On 5 March 2014, Raúl announced he would retire from professional football at the end of the Qatari football season, marking the end of a 20-year-long senior career. Raúl walks onto the pitch as a member of the New York Cosmos for a home game in 2015. On 30 October 2014, Raúl returned to professional football and signed with the New York Cosmos in the United States. He made his North American Soccer League (NASL) debut on 4 April 2015 in a 1–0 win at the Fort Lauderdale Strikers, partially owned by his former Real Madrid strike partner Ronaldo, leaving with a hamstring injury in the second half. The following week, at the Indy Eleven, he scored his first goal to equalise in a 1–1 draw. Raúl scored four times as the undefeated Cosmos won the spring season with five wins and five draws. On 16 October 2015, it was announced Raúl would retire at the end of the season. The Cosmos finished with the best regular season record, winning the North American Supporters' Trophy. On 7 November, he scored the winning goal as his team came from behind to win 2–1 against the Strikers in the semi-finals, earning a place at Soccer Bowl 2015, which his team won 3–2 against the Ottawa Fury eight days later. He communicated his decision to retire following the conclusion of the Soccer Bowl. Raúl began his Spain career at youth level and represented the nation at the FIFA U-20 World Cup 1995, scoring three goals from five matches. He was also part of the under-21 side that reached the final of the 1996 UEFA European Under-21 Championship, and even scored his side's temporary equaliser in the final, although he later missed his penalty in the resulting shoot-out, which was won by Italy. In total, he scored 17 goals at the various youth levels for Spain. With the senior team, Raúl went on for many years to score a national record 44 goals in 102 caps for Spain. However, David Villa later equaled Raúl's record in 2010 and surpassed it on 25 March 2011 in a UEFA Euro 2012 qualifier. Of his 44 international goals, Raúl scored 32 goals in competitive matches, six of which were in the finals of major tournaments and 12 from friendly matches. Raúl earned his first senior cap against the Czech Republic on 9 October 1996, playing the full 90 minutes of a goalless draw in 1998 FIFA World Cup qualification at the Letná Stadion in Prague. In his third match, on 14 December against Yugoslavia at the Mestalla Stadium, he recorded his first international goal in a 2–0 qualifying win. At the final tournament in France, Raúl featured in every match as Spain were eliminated from Group D. He scored in their opening match to put them 2–1 up in an eventual 2–3 loss to Nigeria in Nantes. On 27 March 1999, in a UEFA Euro 2000 qualifier, Raúl scored four goals in Spain's 9–0 rout of Austria. Four days later, he scored three goals in a 6–0 away win against San Marino during the same qualifying tournament. On 5 June, against the same opponents in Villarreal, he was again on target in a 9–0 rout. Raúl played every minute of Spain's Euro 2000 finals campaign in Belgium and the Netherlands, opening their 2–1 win over Slovenia at the Amsterdam Arena before a quarter-final elimination by eventual champions France, in which Raúl missed a last minute penalty which would have taken the tie to extra-time. At the 2002 FIFA World Cup in South Korea and Japan, Raúl opened a 3–1 win over the Slovenes in Spain's first Group B match, and added two more in a 3–2 win over South Africa in Daejeon to advance as group winners. He suffered a groin injury in the round of 16 win over the Republic of Ireland, and missed the remainder of the tournament, in which Spain went out to South Korea in the quarter-finals. On 7 September 2002, Raúl scored in a 2–0 away win over Greece in Euro 2004 qualifying, putting him on 29 goals in 56 internationals, equalling the national goalscoring record set by the recently retired Fernando Hierro. He broke the record on 12 February 2003 when he scored twice in a 3–1 friendly win over Germany at Son Moix in Palma, Mallorca. He started every match at the Euro 2004 finals in Portugal, a group stage exit. Raúl earned his 89th cap on 8 October 2005 in a 2–0 away win over Belgium in 2006 World Cup qualifying, levelling with Hierro as Spain's most-capped outfield player. However, he played less frequently across the campaign as new manager Luis Aragonés preferred to partner David Villa and Fernando Torres. At the final tournament in Germany, he came on at half-time for Luis García in the second group match in Stuttgart, with Spain trailing Tunisia 0–1. When goalkeeper Ali Boumnijel could not retain Cesc Fàbregas' shot in the 72nd minute, Raúl equalised from close range as Spain eventually won 3–1. On 15 August 2006, Raúl won his 100th cap for Spain, in a goalless friendly draw with Iceland in Reykjavík. He was last chosen for the national team on 6 September, in a 3–2 defeat against Northern Ireland in Belfast, a match in which he hit the post late on. A prolific goalscorer and a highly creative forward, Raúl is regarded as one of the greatest and most consistent strikers of his generation. Wearing the number 7 jersey for most of his club and international career, he was capable of playing anywhere along the front line, although he was primarily deployed as a centre-forward, or as a supporting striker. Raúl was a quick, left-footed player, who was capable of scoring both in and outside the penalty area with his accurate and powerful shot. He possessed excellent ball control and technical ability, and was effective in the air as well as with his feet. Although primarily renowned for prolific goalscoring, Raúl was also a highly creative and hardworking player, capable of playing off of his teammates, creating chances and assisting goals, and was occasionally deployed as an attacking midfielder in his later career. In addition to these characteristics, Raúl is remembered for his leadership and discipline – throughout his extensive career, he never received a red card, and he was rarely booked. For his technical skills, elegance, goalscoring and performances, he was nicknamed "El Ferrari", or "The Ferrari," by compatriot Fernando Hierro, another emblematic Real Madrid player. He was also an accurate penalty taker. Raúl has been sponsored by German sportswear company Adidas during his career and has appeared in Adidas commercials. He has advertised Adidas Predator football boots, and in 2004 he starred in an Adidas commercial featuring a number of other stars on mopeds, including Zinedine Zidane, Michael Ballack, Alessandro Del Piero and David Trezeguet. Raúl has featured in Pepsi commercials, including an advertisement for the 2002 World Cup in Korea and Japan where he lined up alongside players including David Beckham, Roberto Carlos and Gianluigi Buffon in taking on a team of Sumo players. Raúl features in EA Sports' FIFA video game series. His regular goal celebration of kissing the ring finger – a show of affection to his wife – appears in FIFA 18. Throughout his career, Raúl's goal celebration consisted of kissing his wedding ring as an acknowledgment to his wife Mamen Sanz, whom he married in 1999 and with whom he has four sons and a daughter: Jorge, Hugo, twins Héctor and Mateo, and María. Jorge and Hugo are both footballers; Jorge at Fordham Preparatory School in New York City and Hugo in New York City FC's academy. 1 Played in Copa del Rey with Real Madrid and DFB-Pokal with Schalke 04 and Qatari Stars Cup, Sheikh Jassem Cup with Al Sadd and Lamar Hunt U.S. Open Cup with New York Cosmos. 2 Played in UEFA Champions League and UEFA Cup/UEFA Europa League with Real Madrid and Schalke 04 and AFC Champions League with Al Sadd. 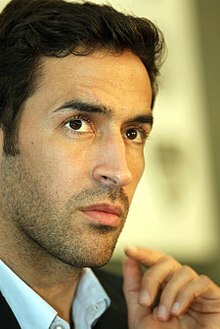 3 Includes other competitive competitions, including the Supercopa de España, UEFA Super Cup, Intercontinental Cup, FIFA Club World Cup with Real Madrid and DFL-Supercup with Schalke 04 and NASL Championship with New York Cosmos..
Raúl made 102 appearances for Spain between 1996 and 2006 and scored 44 goals. He is Spain's second highest goalscorer only behind David Villa. *Includes other European competitive competitions, including the UEFA Cup Winners' Cup, UEFA Intertoto Cup, UEFA Europa League, UEFA Super Cup. ^^Includes other European competitive competitions and Intercontinental Cup. Has not received a red card in entire career. ^ "Raúl". DFB (in German). Retrieved 1 February 2019. ^ "Alfredo Di Stéfano es el mejor jugador de la Historia" (in Spanish). Real Madrid. 14 April 2008. Archived from the original on 25 January 2012. Retrieved 14 February 2014. ^ "Raúl y Di Stéfano, de leyenda a leyenda" (in Spanish). FIFA. 2 February 2009. Retrieved 14 February 2014. ^ Mondal, Subhankar (3 August 2010). "The number 7 is held in high regard..." goal.com. Retrieved 16 September 2013. ^ "Record breaker Raul propels Real". FIFA.com. 15 February 2009. Retrieved 2 May 2013. ^ "Gol 400 de Raúl" (in Spanish). as.com. 19 February 2012. Retrieved 2 May 2013. ^ "1.000 veces Raúl" (in Spanish). marca.com. 27 April 2013. Retrieved 2 May 2013. ^ James Horncastle (23 March 2017). "Gianluigi Buffon is far from finished after 1,000 games between the posts". ESPN FC. Retrieved 24 March 2017. ^ "Delantero del Año de la UEFA" (in Spanish). UEFA.com. Archived from the original on 8 December 2014. Retrieved 5 December 2014. ^ "2001 – MICHAËL OWEN – LE GRAND RETOUR DE L'ANGLETERRE" (in French). francefootball.fr. Archived from the original on 2 November 2012. Retrieved 2 May 2013. ^ Stokkermans, Karel (14 March 2007). "1999/00". RSSSF. Retrieved 2 May 2013. ^ Jain, Nandita. "The Good Life: Raul Gonzalez – The legend who bled white". Goal.com India. Retrieved 23 June 2012. ^ "Jugadores de leyenda". Real Madrid CF. Archived from the original on 7 July 2012. Retrieved 23 June 2012. ^ Pallàs, Joan Josep. "Del blanco al gris" (PDF). Diario El Mundo Deportivo. Retrieved 23 June 2012. ^ a b Nava, Carlos (27 February 2018). "Futbol in América: Dallas Cup's vital role in growing U.S. youth soccer". ESPN Deportes. Retrieved 2 March 2018. ^ "Real Madrid 1996–97". bdfutbol.com. Retrieved 5 December 2014. ^ Arnhold, Matthias (5 July 2017). "Raúl González Blanco - Matches and Goals in Bundesliga". RSSSF. Retrieved 6 July 2017. ^ "Sport / Football : Fifty not out for Raúl Gonzalez". The Hindu. 30 September 2005. Retrieved 3 May 2010. ^ "Defeat mars Raúl record". UEFA.com. 22 February 2006. Retrieved 13 December 2007. ^ "The captain hasn't been booked in two and a half years (Raúl, a gentleman of fair play)". Real Madrid. 24 April 2007. Archived from the original on 10 October 2007. Retrieved 15 December 2007. ^ "Raúl alcanza los 300 goles". Real Madrid. 12 November 2008. Archived from the original on 9 June 2010. Retrieved 3 May 2010. ^ "Messi, Zarra, Ronaldo: The top scorers in La Liga history". Eurosport. 7 October 2014. Archived from the original on 7 February 2015. Retrieved 7 February 2015. ^ "Raúl and Casillas commit to Real". FIFA.com. 14 February 2008. Retrieved 3 May 2010. ^ "Sanchís comments on Raúl's record". Real Madrid. 20 May 1998. Archived from the original on 26 January 2010. Retrieved 3 May 2010. ^ Mondal, Subhankar (3 August 2010). "The number 7 is held in high regard..." goal.com. Retrieved 6 July 2017. ^ "Real maintain pressure at summit". ESPNsoccernet. 24 April 2010. Retrieved 3 May 2010. ^ "Real confirm Raul's Bernabeu departure". RTÉ Sport. 26 July 2010. Archived from the original on 26 July 2010. Retrieved 26 July 2010. ^ "Raul signs for Schalke". FIFA.com. FIFA. 28 July 2010. Retrieved 28 July 2010. ^ a b Lowe, Sid (19 May 2011). "Schalke move has revitalized Raúl". SI.com. Sports Illustrated. Retrieved 6 October 2014. ^ "Van Nistelrooy brace sinks Schalke". ESPN Soccernet. 21 August 2010. Retrieved 23 August 2010. ^ "Raul rescues Schalke late on". ESPN Soccernet. ESPN. 25 September 2010. Archived from the original on 2 November 2012. Retrieved 6 October 2014. ^ "Schalke 04 5–0 Werder Bremen". ESPN Soccernet. 17 December 2011. Retrieved 17 December 2011. ^ "Five-goal Schalke sink Bremen". FIFA.com. 17 December 2011. Retrieved 17 December 2011. ^ "Raúl firma su gol 400 en sus 18 años de profesional" (in Spanish). as.com. 20 February 2012. Retrieved 20 February 2012. ^ "Raúl set to leave Schalke and Europe". UEFA.com. 19 April 2012. Retrieved 19 April 2012. ^ Hassan Talib Haji (20 April 2012). "Legendary Schalke duo unhappy with decision to retire Raul's number". goal.com. Retrieved 4 April 2013. ^ Enis Koylu (6 November 2013). "Meet Max Meyer: The next wonder kid from Schalke's production line". goal.com. Retrieved 24 December 2013. ^ Caferoglu, Livio (12 May 2012). "Official: Al Sadd announce signing of Raul". goal.com. Retrieved 12 May 2012. ^ "Former Real Madrid striker Raul joins Qatar's Al Sadd". Reuters India. 13 May 2012. Retrieved 23 June 2012. ^ "راؤول يتأهل بالسد لمواجهة العربي في لكأس الشيخ جاسم". Al Kass. 5 August 2012. ^ "Real Madrid legend Raul scores on Al Sadd debut". goal.com. 5 August 2012. ^ "Real legend Raúl seals Qatari league title with Al Sadd". as.com. 13 April 2013. ^ "The Pearl of Qatar!". Doha Stadium Plus. 22 May 2013. Archived from the original on 4 March 2016. Retrieved 18 September 2015. ^ "Raul finds the net for Real and wears his iconic No 7 shirt on emotional return to Madrid for Santiago Bernabeu Trophy". Daily Mail. 22 August 2013. Retrieved 23 August 2013. ^ "Raul to retire from football". football-espana.net. 5 March 2014. Retrieved 27 July 2014. ^ "Cosmos Sign Legendary Spanish Striker Raúl González Blanco". New York Cosmos. 30 October 2014. Retrieved 30 October 2013. ^ Newman, Benjamin (6 April 2015). "Raul beats Ronaldo as the NY Cosmos get a win over the Fort Lauderdale Strikers [Videos]". 101 Great Goals. Retrieved 17 October 2015. ^ "New York Cosmos 1, Indy Eleven 1 New York Cosmos standout player Raul holds up one fingerBuy Photo". Indianapolis Star. 12 April 2015. Retrieved 17 October 2015. ^ "BY THE NUMBERS 2015 SPRING SEASON". North American Soccer League. 22 June 2015. Retrieved 17 October 2015. ^ "Spain and Real Madrid icon Raúl to retire at end of season". The Guardian. 16 October 2015. Retrieved 16 October 2015. ^ "New York Cosmos bid farewell to Raul with NASL title victory". The Guardian. 16 November 2015. Retrieved 16 November 2015. ^ "Nigeria Rallies to Stun Spain With Late Goal". Washington Post. Associated Press. 13 June 1998. Retrieved 17 October 2015. ^ Ros, Cayetano (28 March 1999). "España vive una noche idílica" [Spain experience an idyllic night]. El País (in Spanish). Retrieved 17 October 2015. ^ "España golea a San Marino por 0-6 y se coloca en el primer puesto de su grupo" [Spain thrash San Marino 0–6 and take first place in their group]. El País (in Spanish). 1 April 1999. Retrieved 17 October 2015. ^ "España firma una nueva goleada ante San Marino" [Spain sign a new thrashing against San Marino]. El Mundo (in Spanish). 6 June 1999. Retrieved 17 October 2015. ^ "Etxeberria spares Spain's blushes against Slovenia". UEFA. 6 October 2003. Retrieved 17 October 2015. ^ "Raul miss sends France through". BBC. 25 June 2000. Retrieved 9 February 2016. ^ "Spain see off Slovenia". BBC Sport. 2 June 2002. Retrieved 17 October 2015. ^ "Heartbreak for South Africa". BBC Sport. 12 June 2002. Retrieved 17 October 2015. ^ "Raul, Tristan and Abelda doubts for Spain". The Irish Times. 21 June 2002. Retrieved 17 October 2015. ^ "Raul delighted to equal record". ESPN. Reuters. 3 September 2002. Retrieved 17 October 2015. ^ "Raúl acaba con Alemania y entra en la historia" [Raúl finishes off Germany and enters history] (in Spanish). Diario AS. 12 February 2003. Retrieved 17 October 2015. ^ "Raul to equal Hierro's Spanish appearance record". The Times of Malta. Reuters. 8 October 2005. Retrieved 17 October 2015. ^ "Spain 3-1 Tunisia". BBC Sport. 19 June 2006. Retrieved 17 October 2015. ^ "Un empate ante Islandia amarga el partido cien de Raúl" [A draw against Iceland makes Raúl's 100th match bitter]. Nación (in Spanish). 15 August 2006. Archived from the original on 4 March 2016. Retrieved 17 October 2015. ^ "Northern Ireland 3-2 Spain". BBC Sport. 6 September 2006. Retrieved 17 October 2015. ^ a b "Remembering Raúl, still the Champions League's greatest goalscorer". sbnation.com. 1 October 2014. Retrieved 3 December 2014. ^ "Cosmos sign legendary spanish striker Raúl". Marca. 30 October 2014. Retrieved 3 December 2014. ^ "Raúl, todos los récords del hombre récord". Retrieved 3 December 2014. ^ a b c "Campioni ai raggi X: Raul, l'immortale" (in Italian). CalcioMercato.it. Retrieved 3 December 2014. ^ "Ganador nato, líder indiscutible, madridista de corazón" [Born winner, indisputable leader, Madridista at heart] (in Spanish). RealMadrid.com. Retrieved 3 December 2014. ^ "Raul Rediscovering His Form At Real Madrid As A 'Trequartista'". Goal.com. 23 February 2009. Retrieved 13 January 2017. ^ a b "Which players have never been sent off?". UEFA. 8 February 2017. Retrieved 15 October 2018. ^ "Raul, dieci in condotta" (in Italian). La Gazzetta dello Sport. 14 May 2007. Retrieved 3 December 2014. ^ "Raúl González, 'caballero del honor'" (in Spanish). 20minutos.es. Retrieved 3 December 2014. ^ "Hierro: Raúl es un Ferrari de la selección y del Real Madrid" (in Spanish). mundodeportivo.com. 26 July 2010. Retrieved 5 December 2014. ^ "Alonso row with Ronaldo played down". The Independent. 23 February 2010. Retrieved 28 March 2019. ^ "Das Vorzeigespielerpaar um Raúl González Blanco". EM 2008. Retrieved 3 May 2010. ^ "Nace María González, hija de Raúl González". AS.com. 1 January 2007. Retrieved 3 May 2010. ^ Jiménez, Rubén; Winterburn, Chris. "Raul's son scoring goals in the Big Apple". MARCA. Retrieved 5 January 2017. ^ Callero, Borja Luis; Gillingham, Geoff. "Raul's son begins career with New York rivals". MARCA. Retrieved 14 December 2016. ^ "Raúl González Blanco - Goals in International Matches". Rec.Sport.Soccer Statistics Foundation. Retrieved 4 July 2016. ^ "UEFA Champions League 2002/03 - History - Statistics – UEFA.com". UEFA.com. Retrieved 25 October 2017. ^ "Raúl wins the Di Stéfano Trophy". Real Madrid. 20 May 2008. Archived from the original on 30 June 2009. Retrieved 6 August 2008. ^ "Di Stéfano's worthy heir". Real Madrid. 14 September 2008. Archived from the original on 17 September 2008. Retrieved 14 September 2008. ^ "Raúl gana el I Trofeo Di Stéfano". Marca.com. 7 July 2011. Retrieved 7 July 2011. ^ "Raúl recibe el MARCA Leyend". Marca.com. 3 March 2009. Retrieved 11 February 2011. ^ "Juli 2013" (in German). sportschau.de. Retrieved 14 February 2014. ^ "Grateful Spain rewards Raúl". UEFA. 25 May 2006. Retrieved 7 July 2008. ^ "Raúl recibirá la Medalla de Oro de Madrid". Marca.com. 5 March 2009. Retrieved 5 March 2009. Wikimedia Commons has media related to Raúl González. This page was last edited on 17 April 2019, at 13:53 (UTC).